Kenya Airways Ltd., more commonly known as Kenya Airways, is the flag carrier airline of Kenya. The company was founded in 1977, after the dissolution of East African Airways. Their head office is located in Embakasi, Nairobi, with its hub at Jomo Kenyatta International Airport. The airline was owned by the Government of Kenya until April 1995 (1995-04), and it was privatised in 1996, becoming the first African flag carrier to successfully do so. Kenya Airways is currently a public-private partnership. The largest shareholder is the Government of Kenya (48.9%), 38.1% is owned by KQ Lenders Company 2017 Ltd. (in turn owned by a consortium of banks), followed by KLM, which has a 7.8% stake in the company. The rest of the shares are held by private owners; shares are traded on the Nairobi Stock Exchange, the Dar es Salaam Stock Exchange, and the Uganda Securities Exchange. The airline became a member of SkyTeam in June 2010 (2010-06), and is also a member of the African Airlines Association since 1977. In July 1980 (1980-07) the airline had 2,100 employees and a fleet of three Boeing 707-320Bs, one Boeing 720B, one DC-9-30 and three Fokker F-27-200s. At this time, Addis Ababa, Athens, Bombay, Cairo, Copenhagen, Frankfurt, Jeddah, Kampala, Karachi, Khartoum, London, Lusaka, Mauritius, Mogadishu, Rome, Salisbury, Seychelles and Zurich were among the airline's international destinations, whereas domestic routes radiated from Nairobi to Kisumu, Malindi, Mombasa and Mumias. A Nairobi–Bombay nonstop route was launched in 1982 using Boeing 707-320Bs. A year later, the company commenced serving Tanzania. Flights to Burundi, Malawi and Rwanda were launched in 1984. Capacity on the European routes was boosted in November 1985 (1985-11) with the incorporation of an Airbus A310-200 leased from Condor. Kilimanjaro was first served in March 1986 (1986-03). That year, the airline ordered two Airbus A310-300s. Kenya Airways was the first African carrier to acquire the type, and they were the first wide-bodies ordered by the company. Funded with a US$20,000,000 (equivalent to $45,713,418 in 2018) loan, the delivery of these two aircraft took place in May and September 1986 (1986-09). They flew on the Kenya–Europe corridor, and permitted Kenya Airways to return the A310-200 to the lessor. In early 1988, the carrier ordered two Fokker 50s; for domestic routes, the airline received the first of these aircraft at the end of the year. Also in 1988, the lease of a third A310-300 was arranged with the International Lease Finance for a ten-year period; the aircraft joined the fleet in November 1989 (1989-11). Leased from Ansett Worldwide, the first Boeing 757-200 was received in January 1990 (1990-01), whereas a third Fokker 50 was acquired in October the same year. By late 1991, two Boeing 737-200s had been leased from Guinness Peat Aviation. In January 2000 (2000-01), the airline experienced its first fatal accident when an Airbus A310 that had been bought new in 1986 crashed off Ivory Coast, shortly after taking off from Abidjan. By April the same year, the fleet consisted of four Airbus A310-300s,[nb 2] two Boeing 737-200 Advanced and four Boeing 737-300s. At this time the company had a staff of 2,780, including 400 engineers, 146 flight crew and 365 cabin crew. From its main hub at Jomo Kenyatta International Airport, scheduled services were operated to Abidjan, Addis Ababa, Amsterdam, Bujumbura, Cairo, Copenhagen, Dar es Salaam, Douala, Dubai, Eldoret, Entebbe/Kampala, Harare, Johannesburg, Karachi, Khartoum, Kigali, Kinshasa, Lagos, Lilongwe, Lokichoggio, London, Lusaka, Mahe Island, Malindi, Mombasa, Mumbai, and Zanzibar. :90 In 2002, an order for three Boeing 777-200ERs was placed with Boeing; an additional aircraft of the type was acquired in November 2005 (2005-11). In March 2006 (2006-03), six Boeing 787-8s were ordered; the first two examples would be delivered in 2010 and the rest in 2011. The original Boeing 787 order was amended nine months later to include three more aircraft of the type. The first Embraer 190 joined the fleet in December 2010. Operational results for fiscal years 2015 and 2016 showed substantial losses. The rapid expansion of the fleet and routes (dubbed "Project Mawingu") was cited as the primary cause of the downturn. Fuel-price hedging and the 1996 agreement with KLM, considered intrusive in the running of the flag carrier, took secondary blame. Corrective measures were taken to improve the financial and operational position of the airline and avert insolvency. The route partnership with KLM was deemed profitable thus, kept. However, the parties agreed to amend some features of the deal that had negative effect on KQ -IATA code for Kenya Airways. Two Boeing B737-700 were sold and five newer, leased airliners were sub-leased to improve cash flow. Efforts to financially re-position the carrier were successful at the end of 2017. In a complex deal, stakeholders agreed to convert close to half a billion US dollars in loans to equity, changing the ownership structure. The government of Kenya, the biggest lender, saw its holdings rise from 29.8% to 48.9% while that of KLM was diluted from 26.7% down to 7.8%. A consortium of local banks, through a special-purpose vehicle called: "KQ Lenders Company 2017 Ltd.", ended up with 38.1%. The latter entity is obligated with a loan from the above local banks in the amount of US$225 million; this amount, in turn, is guaranteed by the government. The airline's employees, through a shareholding scheme, and others own the remaining 5.2%. The Government of Kenya issued a guarantee for a further US$525 million debt owed to Import-Export Bank of the United States, financier of the newer Boeing planes of its fleet. In a bid to recover their exposure, syndicated lease holders and banks unsuccessfully fought these measures to restructure the carrier's ownership. Low-cost carrier Jambojet, created in 2013, and African Cargo Handling Limited are both wholly owned subsidiaries of Kenya Airways. Partly-owned companies include Kenya Airfreight Handling Limited, dedicated to the cargo handling of perishable goods (51%-owned) and Tanzanian carrier Precision Air (41.23%-owned). As of October 2016[update], Michael Joseph is the airline's chairman. Joseph is the former CEO of Safaricom, the leading telecom operator in Kenya. As of January 2018[update], Sebastian Mikosz is Kenya Airways Group's managing director and chief executive officer (CEO). Mikosz was formerly CEO of LOT Polish Airlines, and took office on 1 June 2017. Kenya Airways serves 53 destinations in 41 countries, as of November 2017[update]. KLM sponsored Kenya Airways' SkyTeam candidacy process in mid-2005. In September 2007 (2007-09), Kenya Airways became one of the first official SkyTeam Associate Airline and achieved full membership in June 2010 (2010-06). The alliance provides Kenya Airways' passengers with access to the member airlines' worldwide network and passenger facilities. In April 2012 (2012-04), the airline launched a plan named Project Mawingu (the Swahili word meaning Clouds) to add 24 destinations by 2021, including the start of services to Australia and North and South America, and expanding its presence in Asia as well; this includes initiating routes to Dhaka, Kunming and Seoul in Fiscal Year 2019-20 and to Prague, Ürümqi and Hanoi in Fiscal Year 2020-21. An outline of a plan to restore profitability was disclosed in a March 2018 interview given by the CEO and the chairman of the company. The turnaround operation will include route expansion, pursuing the high-end segment of the market and, on partnerships and joint ventures with other airlines. The carrier plans to add up to twenty new destinations in Africa, Europe and Asia in the next five years. Five sub-leased aircraft are to re-join the fleet by the end of 2019 to facilitate this move. Preparations are underway to roll out an economy-plus class to target the business and high-end leisure travelers. Direct flights to luxury-tourism destinations in the Indian Ocean are also planned. Talks are underway with South African Airways regarding route-sharing and aircraft-maintenance collaboration; this is the other focus of the turnaround scheme. In December 2018 Kenya Airways revealed plans to start flights between Nairobi and Windhoek, Namibia. An Embraer 170 at Jomo Kenyatta International Airport in 2007. Boeing 777-300ER 3 — TBA Currently sub-leased to Turkish Airlines. Will be returned in mid 2018 – 2019. Leased jets will be returned in mid 2018 – 2019. The first of four converted Boeing 737-300s was delivered to the company in April 2013 (2013-04); Kenya Airways planned to fly this aircraft on African routes served by the Embraer 190s, in order to boost cargo capacity. The company took delivery of its first Boeing 777-300ER in October 2013. Kenya Airways phased out its Boeing 777s in May 2015 after the airline made losses and incurred debts in the previous financial year. The Boeing 777-300ER fleet was leased to Turkish Airlines in May 2016. 5Y-BBK, a Kenya Airways Boeing 707-320B in 1986, was damaged beyond economical repair on 11 July 1989, in an accident at Bole International Airport. As of October 2014[update], Kenya Airways has had two fatal accidents and two hull-loss accidents. 30 January 2000: Flight 431 was a scheduled Abidjan–Lagos–Nairobi service, operated with an Airbus A310-304, registration 5Y-BEN, that plunged into the Atlantic Ocean and broke up, about a minute after taking off from Abidjan's Félix Houphouët-Boigny International Airport. There were 179 people aboard, including a crew of ten; most of the occupants were Nigerians. 169 people were killed. 5 May 2007: Flight 507, operated by a Boeing 737-800, tail number 5Y-KYA, crashed into a mangrove swamp immediately after takeoff for Nairobi, about 5.5 kilometres (3.42 mi) southeast of Douala International Airport. The flight originated in Abidjan, with a stopover in Douala to pick up passengers. All 114 people on board (105 passengers and 9 crew) were killed. ^ Flight International also reported that Kenya Airways flew Douglas DC-9-32s previously operated by EAA. ^ It is likely that Flight International records had not been updated at the time of publish. Another source informed that the number of A310s in fleet immediately after the crash was three. ^ a b "Profile on Kenya Airways". Centre for Aviation. Archived from the original on 27 September 2012. Retrieved 26 September 2012. ^ O'Keeffe, Niall (7 August 2013). "Fire closes Nairobi's Jomo Kenyatta airport". Flightglobal. Archived from the original on 8 August 2013. Flag carrier Kenya Airways has confirmed that all flights from the airport have been cancelled until further notice. ^ "Kenya Contact Details". Kenya Airways. Archived from the original on 1 August 2012. Retrieved 1 August 2012. ^ a b Buyck, Cathy (1 November 2010). "Kenya Airways' Uplifting Mission". Air Transport World. Archived from the original on 2 August 2012. Retrieved 2 August 2012. ^ Lacey, Marc (24 June 2003). "New Products for Sale in Africa: Company Shares". The New York Times. Archived from the original on 19 April 2012. Retrieved 19 April 2012. ^ "Treasury moves to ease KLM's grip on Kenya Airways". 19 November 2017. ^ a b c d "History". Kenya Airways. Retrieved 6 December 2011. ^ "AFRAA Current Members". AFRAA. Retrieved 6 December 2011. ^ Endres, Günter (20 December 2005). "Titus Naikuni: Walking tall". Flightglobal.com. Airline Business. Archived from the original on 18 May 2012. ^ a b Guttery (1998), p. 97. ^ "World airline directory – Kenya Flamingo Airways" (pdf). Flight International: 855. 31 March 1984. Retrieved 7 December 2011. ^ "World airline directory – Kenya Airways" (pdf). Flight International: 1382–1383. 28 April 1979. Retrieved 2 April 2011. Aer Lingus is providing technical and management assistance under contract. ^ Guttery (1998), p. 97,98. ^ a b c d Guttery (1998), p. 98. ^ "Kenya buys widebodies". Flight International: 5. 19 October 1985. Archived from the original on 1 August 2012. Retrieved 1 August 2012. ^ "Finance". Flight International: 7. 27 September 1986. Archived from the original on 1 August 2012. Retrieved 1 August 2012. A $20 million loan has been guaranteed by the Export Credits Guarantee Department (ECGD) to help finance Kenya Airways' purchase of two Airbus A310-300s. Finance has been arranged by the Midland Bank. ^ a b "Air transport". Flight International: 7. 8 November 1986. Archived from the original on 1 August 2012. Retrieved 1 August 2012. Kenya Airways has just taken delivery of a second Airbus A310-300. ^ "Market Place". Flight International: 14. 6 February 1988. Archived from the original on 2 August 2012. Retrieved 2 August 2012. Kenya Airways has ordered two Fokker 50s for delivery in late 1988. Already an F.27 operator, Kenya Airways is taking the aircraft as part of a fleet modernisation and expansion programme. ^ "Orderbook". Flight International: 13. 10 December 1988. Archived from the original on 2 August 2012. Retrieved 2 August 2012. Kenya Airways has taken delivery of its first Fokker 50 turboprop. ^ "Orderbook". Flight International. 134 (4128): 49. 27 August 1988. ISSN 0015-3710. Archived from the original on 26 October 2013. ^ a b c d e f g Guttery (1998), p. 99. ^ a b Winn, Allan (6 November 1996). "Kenya's Dutch treat". Flightglobal. Nairobi. Archived from the original on 25 June 2014. ^ a b O'Toole, Kevin (7 June 1995). "Foreign alliance on offer from Kenya". London: Flightglobal.com. Flight International. Archived from the original on 28 August 2012. Retrieved 28 August 2012. ^ a b c d e "Kenya Airways Privatization" (PDF). International Finance Corporation. Archived from the original (PDF) on 18 May 2012. Retrieved 18 May 2012. ^ "Profits help Kenya Airways towards privatisation". Flightglobal.com. Flight International. 20 September 1995. Archived from the original on 28 August 2012. Retrieved 28 August 2012. ^ a b "Strong foreign interest boosts Kenya float". Flightglobal.com. Flight International. 8 May 1996. Archived from the original on 28 August 2012. Retrieved 28 August 2012. ^ a b "No haste, just speed". Flightglobal.com. Airline Business. 1 March 1996. Archived from the original on 28 August 2012. Retrieved 28 August 2012. ^ "World Airline Directory – Kenya Airways". Flight International. 4619 (153): 70. 1–7 April 1998. ISSN 0015-3710. Archived from the original on 28 August 2012. ^ Gilpin, Kenneth N. (16 July 1996). "G.E. Gives Airbus a $2.5 Billion Jet Order". The New York Times. Archived from the original on 25 June 2014. ^ a b "Kenyan plane crashes into sea". BBC News. 31 January 2000. Archived from the original on 3 March 2012. ^ a b "Airline's sound safety record". BBC News. 31 January 2000. Archived from the original on 3 March 2012. ^ Sobie, Brendan (16 November 2005). "Kenya Airways acquires additional 777-200ER and 767-300ER". Flightglobal. London. Flight International. Archived from the original on 13 June 2014. ^ "Kenya airways to take Boeing 787s". Flightglobal. Flight International. 7 March 2006. Archived from the original on 14 June 2014. ^ a b Kaminski-Morrow, David (1 September 2010). "Kenya Airways threatens to ditch 787 for Airbus". Flightglobal.com. Flight International. Archived from the original on 18 May 2012. Retrieved 17 May 2011. ^ Buyck, Cathy (15 September 2011). "Kenya Airways receives third new E-190". Air Transport World. Archived from the original on 2 June 2012. Retrieved 2 June 2012. Kenya Airways (KQ) took delivery of its third new Embraer 190, as part of an order for five of the type placed last year. KQ received the first E-190 in December 2010 and the second one joined the fleet in June; the fourth aircraft is expected to touch down at Jomo Kenyatta International in a few weeks. ^ Okulo, Lola (10 June 2012). "KQ rights issue misses set target". The Star. Archived from the original on 10 June 2012. Retrieved 10 June 2012. ^ "Kenya Airways Rights Issue–Amended Timetable" (PDF) (Press release). Kenya Airways. 30 May 2012. Archived from the original (PDF) on 10 June 2012. Retrieved 10 June 2012. ^ Buyck, Cathy (10 November 2011). "Kenya Airways' fiscal first-half profit surges 41.6%". Air Transport World. Archived from the original on 19 April 2012. ^ "Public Announcement–Kenya Airways Rights Issue Offer Results" (PDF) (Press release). Kenya Airways. 8 June 2012. Archived from the original (PDF) on 9 June 2012. Retrieved 10 June 2012. ^ "Government now largest shareholder of Kenya Airways". Sunday Nation. 7 June 2012. Archived from the original on 9 June 2012. ^ "Kenya Airways records country's worst ever loss". 21 July 2016. Retrieved 1 May 2018. ^ "Treasury moves to ease KLM's grip on Kenya Airways". 19 November 2017. Retrieved 1 May 2018. ^ "KQ sells two planes in bid to shore up its finances". 6 October 2017. Retrieved 1 May 2018. ^ "Completion of the restructuring the debt and equity of Kenya Airways PLC" (PDF). 16 November 2018. Retrieved 1 May 2017. ^ "Intrigues behind Kenya Airways debt restructuring". 3 December 2017. Retrieved 1 May 2018. ^ Blachly, Linda (12 September 2013). "Kenya Airways appoints CEO of new Jambo Jet subsidiary". Air Transport World. Archived from the original on 16 September 2013. ^ "Kenya Airways Annual Report & Financial Statements For The Year Ended 31 March 2011". African Financials. Archived from the original on 18 May 2012. Retrieved 18 May 2012. ^ a b "Annual Reports & Financial Statements 2013" (PDF). Kenya Airways. 13 June 2013. Archived from the original (PDF) on 27 October 2013. ^ a b "2007-2008 Annual Report" (PDF). Kenya Airways. Archived from the original (PDF) on 1 August 2012. ^ a b c "Annual Report & Accounts 2009-2010" (PDF). Kenya Airways. Archived from the original (PDF) on 1 August 2012. Retrieved 1 August 2012. ^ a b "Business and Financial Review–Full Year Ended 31 March 2012" (PDF). Kenya Airways. Archived from the original (PDF) on 15 June 2012. Retrieved 1 August 2012. ^ "Summary audited group results for the year ended 31 March 2013" (PDF). Kenya Airways Limited. 13 June 2013. Archived from the original (PDF) on 17 June 2013. ^ "Kenya Airways Annual Report and Financial Statements 2014" (PDF). Kenya Airways. Archived from the original (PDF) on 1 October 2014. ^ "Summary Audited Group Results for the Year Ended 31 March 2015" (PDF). 29 July 2015. Retrieved 5 August 2015. ^ "Annual Report 2015" (PDF). 29 July 2015. Retrieved 19 October 2015. ^ "Summary Audited Group Results for the Year Ended 31 March 2016" (PDF). Kenya Airways Limited. Archived from the original (PDF) on 24 July 2016. ^ "Press Statement - Kenya Airways Returns to Profitability" (PDF). 25 May 2017. Retrieved 10 July 2017. ^ "Michael Joseph takes helm of Kenya Airways as Awori resigns". 26 October 2016. ^ Hofmann, Kurt (12 January 2018). "Kenya Airways to launch first US services in October 2018". Air Transport World. Archived from the original on 12 January 2018. ^ Dron, Alan (5 May 2017). "Kenya Airways announces new CEO". Air Transport World. Archived from the original on 7 May 2017. ^ "SkyTeam Facts and Figures" (PDF). SkyTeam. November 2017. Archived from the original (PDF) on 3 November 2017. ^ Farrar, Loren (10 June 2005). "SkyTeam to add four carriers to new Associate Program". Air Transport World. Archived from the original on 10 August 2012. Retrieved 10 August 2012. ^ "SkyTeam welcomes Air Europa, Copa , Kenya as associates". Air Transport World. 5 September 2007. Archived from the original on 31 March 2012. ^ "Air France: 3 compagnies rejoignent le réseau SkyTeam" [Air France: three companies joins the SkyTeam network]. L'Express (in French). 4 September 2007. Archived from the original on 31 March 2012. Retrieved 31 March 2012. ^ "SkyTeam celebrates tenth anniversary" (Press release). KLM. 23 June 2010. Archived from the original on 31 March 2012. Retrieved 31 March 2012. ^ Aaron Karp (23 June 2010). "SkyTeam eyes further expansion on 10th anniversary". Air Transport World. Archived from the original on 31 March 2012. Retrieved 31 March 2012. ^ "About Us". SkyTeam. Archived from the original on 19 April 2012. Retrieved 19 April 2012. Our 15 member airlines provide you comprehensive access to an extensive global network with more destinations, more frequencies and more connectivity than ever before. ^ "SkyTeam Lounges". SkyTeam. Archived from the original on 19 April 2012. Retrieved 19 April 2012. ^ "Profile on Kenya Airways". CAPA. Centre for Aviation. Archived from the original on 29 October 2016. Retrieved 29 October 2016. 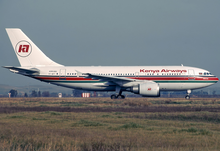 ^ "Alitalia / Kenya Airways resumes codeshare partnership from June 2019". Routesonline. 21 March 2019. ^ "Kenya: National Airways Inks Code Share Deal With China Eastern Airlines". AllAfrica.com. 13 December 2012. Archived from the original on 25 February 2013. ^ "Kenya Airways, Delta sign codeshare deal ahead of direct US". ^ "Kenya Airways-Etihad alliance will create a poweful force in Eastern Africa, challenging Ethiopian". Centre for Aviation. 25 February 2013. Archived from the original on 25 February 2013. ^ "Kenya Airways and Etihad Airways in codeshare deal to enhance their global network coverage" (Press release). Kenya Airways. 21 February 2013. Archived from the original on 25 February 2013. ^ "Kenya Airways boosts South East Asian footprint with new code share deal" (PDF) (Press release). Kenya Airways. Archived from the original (PDF) on 12 November 2012. Retrieved 12 November 2012. ^ "Rapidly expanding Kenya Airways charts growth with plan to serve every inhabited continent by 2017". Centre for Aviation. 16 April 2012. Archived from the original on 19 April 2012. ^ Clark, Oliver (7 October 2013). "ROUTES: Kenya Airways plans global network over 10 years". Flightglobal. Las Vegas. Archived from the original on 25 June 2014. ^ a b "Kenya Airways May Add as Many as 20 New Routes in Five Years". 21 March 2018. Retrieved 8 May 2018. ^ a b "Kenya Airways eyeing new routes to restore profitability". 26 March 2018. Retrieved 8 May 2018. ^ "Kenya Airways looks upmarket for financial salvation". 6 March 2018. Retrieved 8 May 2018. ^ "Kenya opens talks with neighbours to allow KQ flights". ^ "Kenya Airways fleet". Kenya Airways. Retrieved 4 June 2018. ^ "Kenya Airways to take back sub-leased B777s, B787s". Ch-Aviation. 24 March 2018. ^ "Oman Air wet leases 787-8s from Kenya Airways". ATW Online. 9 March 2016. ^ "Oman Air to lease 2 Boeing 787-8s and Heathrow slots". ATW Online. 1 March 2016. ^ Hofmann, Kurt (8 June 2018). "Kenya Airways considers Bombardier CSeries, Embraer E2 order". Air Transport World. ^ "SubFleets for: Kenya Airways". AeroTransport Data Bank. 17 June 2013. Archived from the original on 17 June 2013. ^ "Kenya Airways introduces its first Boeing 737–300". Flightglobal.com. Flight International. 14 May 1997. Archived from the original on 18 May 2012. Retrieved 18 May 2012. The aircraft - central to the hub's regional development - are replacing two 737-200s leased from GPA. ^ a b "Our Fleet". Kenya Airways. Archived from the original on 5 October 2015. ^ Geoff Thomas (23 July 2002). "Kenya Airways chooses Trent 800 for Boeing 777 order". Flightglobal.com. Flight Daily News. Archived from the original on 18 May 2012. Retrieved 18 May 2012. The airline is currently celebrating its silver jubilee – and its links with Rolls-Royce began with Dart engines for Fokker F27s...moving more recently to RB211-535s on its Boeing B-757s. ^ "Kenya Airways to focus on Asia, with new Beijing and Shanghai routes, as 787s and more 777s arrive". Centre for Aviation. 18 March 2014. Archived from the original on 19 March 2014. ^ a b "Boeing Delivers Kenya Airways' First 777-300ER" (Press release). Boeing. 25 October 2013. Archived from the original on 25 June 2014. ^ Young, Kathryn M. (11 April 2013). "Kenya Airways receives first 737-300 converted freighter". Air Transport World. Archived from the original on 15 April 2013. ^ Blachly, Linda (25 October 2013). "Kenya Airways receives first leased Boeing 777-300ER". Air Transport World. Archived from the original on 29 October 2013. ^ Buyck, Cathy (15 April 2011). "Kenya settles with Boeing on 787 delivery delay". Air Transport World. Archived from the original on 18 May 2012. Retrieved 18 May 2012. ^ "Boeing Delivers First 787 Dreamliner to Kenya Airways" (Press release). Boeing. 4 April 2014. Archived from the original on 4 April 2014. ^ Yeo, Ghim-Lay (4 April 2014). "Kenya Airways receives first 787". Flightglobal. Washington DC. Archived from the original on 4 April 2014. ^ "Airline News". 11 June 2014. Archived from the original on 11 June 2014. Kenya Airways launched its first Boeing 787 on the Nairobi-Paris route on June 4. ^ "Kenya Airways to retire its Boeing 777s this summer". 28 April 2015. ^ "Behramjee's Airline News: Kenya Airways to retire its entire Boeing 777 fleet". 29 April 2015. ^ "Kenya Airways subleases Boeing 777-300ER aircraft to Turkish Airlines". 8 May 2016. ^ a b c d "Lounges". Kenya Airways. Archived from the original on 18 May 2012. Retrieved 18 May 2012. ^ "Msafiri Magazine". Kenya Airways. Archived from the original on 18 May 2012. Retrieved 18 May 2012. ^ "Boeing 787-8". Kenya Airways. Retrieved 2 June 2014. ^ "Boeing 737-700". Kenya Airways. Retrieved 2 June 2014. ^ "Embraer 190 AR". Kenya Airways. Retrieved 2 June 2012. ^ "Accident record for Kenya Airways". Aviation Safety Network. Retrieved 26 October 2014. ^ Accident description for 5Y-BBS at the Aviation Safety Network. Retrieved on 20 September 2011. ^ Incident description for 5Y-BBK at the Aviation Safety Network. Retrieved on 15 July 2011. ^ "Commercial Flight Safety – Non-fatal accidents/incidents: scheduled passenger flights". Flight International: 46. 17–23 January 1990. Archived from the original on 14 June 2014. ^ Accident description for Flight 431 at the Aviation Safety Network. Retrieved on 9 June 2011. ^ a b Accident description for Flight 507 at the Aviation Safety Network. Retrieved on 15 June 2011. ^ Kaminski-Morrow, David (15 May 2007). "Investigators trawl swamps for clues on Kenya 737 crash". Flightglobal.com. Flight International. Archived from the original on 10 August 2012. Retrieved 10 August 2012. ^ "'No survivors' in Cameroon crash". BBC News. 7 May 2007. Archived from the original on 10 August 2012. Retrieved 10 August 2012. "2010-2011 Annual Report" (PDF). Kenya Airways. Archived from the original (PDF) on 31 July 2012. "2008-2009 Annual Report" (PDF). Kenya Airways. Archived from the original (PDF) on 1 August 2012.